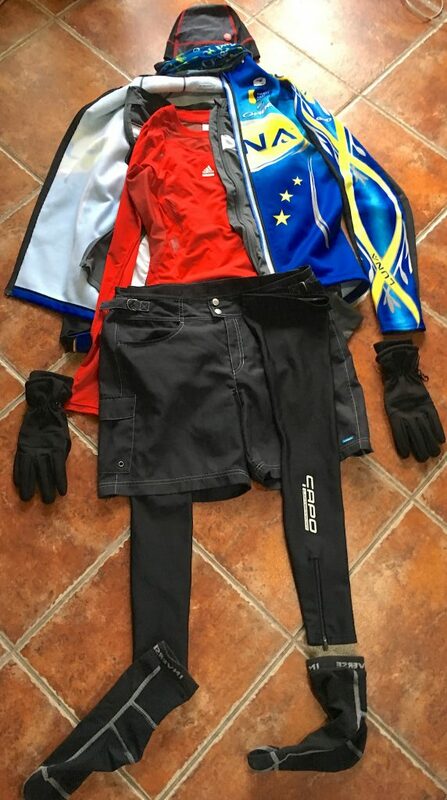 What to wear in Massachusetts (USA) when it’s 15ºF/-9ºC: balaclava with neoprene face cover; fleece-lined neck warmer; synthetic base layer; wool cycling jersey; fleece-lined vest and jacket; 4-fingered gloves; cycling shorts; tights; wind pants; and thermal socks (missing: neoprene shoe covers). 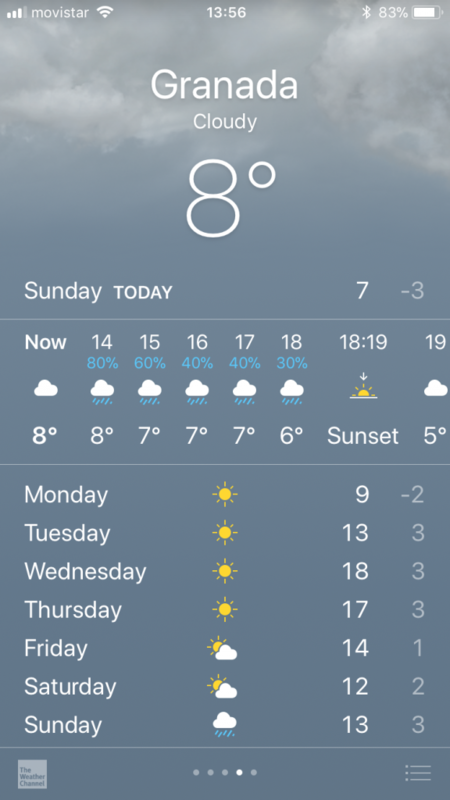 The daytime temperature arc for Granada in January ranges from 34-37ºF (1-3ºC) in the morning to 52-55ºF (11-13ºC) at midday. 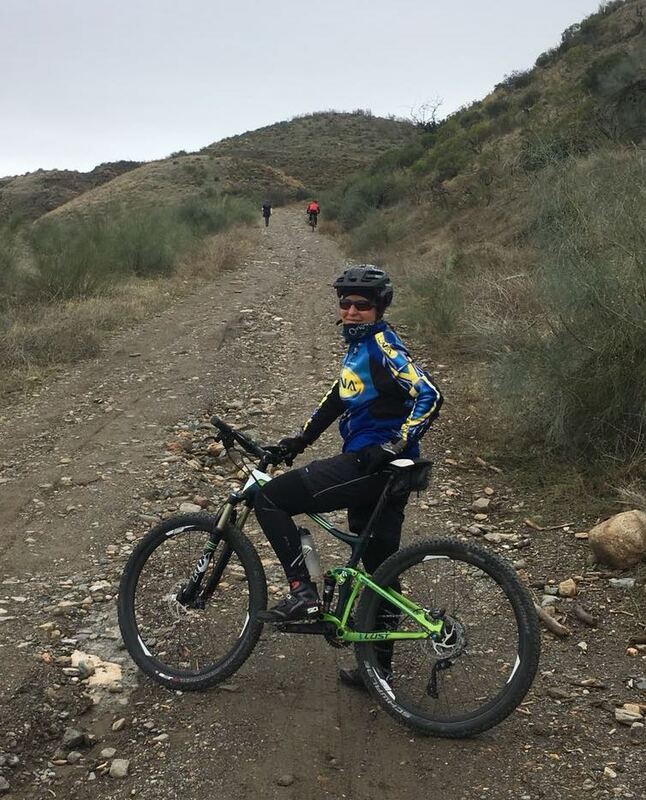 What to wear is somewhat dependent on where you ride, especially if you’re planning on riding up into the mountains since the sustained climb can get pretty warm and then instantly switch to bone-chilling on the way down. An extra pair of gloves for the descent plus a wind jacket would both be a good idea to bring along. If there’s been a lot of rain, there will be lots of puddles so if you don’t want that cold water enema every time you splash through a puddle, then a small, snap-on fender would spare you from getting wet, then cold. 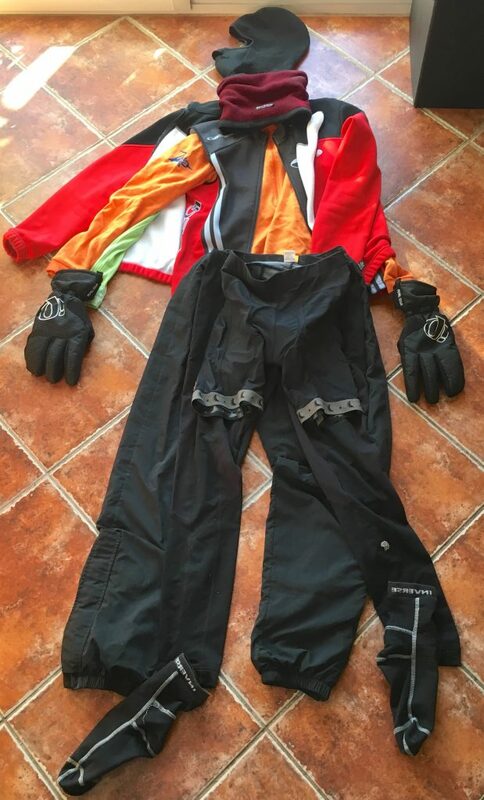 Typical winter riding “uniform” for Granada: lycra cap; cotton neck warmer; synthetic base layer; lycra jersey; fleece-lined jacket; gloves; cycling shorts — either baggies or lycra; leg warmers or tights; and thermal socks. I also use winter mtb shoes usually from around December until the end of February. Except for one day out of the last 8+ years I’ve been here, I haven’t needed much more for riding in the depths of winter in Granada.